Personalized Trade Show Tablecloths: Planning your next business trade show? Great! The Executive Advertising has everything you need to make this event a huge success with our custom tablecloths! Why? To attract your new consumers immediately to your booth! Our advertising tablecloths are a huge hit for your business name and logo. Our personalized trade show tablecloths are customized to your taste and to the taste of your customers. When you let The Executive Advertising customize your tablecloths, you will get it the way you want it every time! And don’t worry about time, we always guarantee that your marketing tablecloth will arrive on time looking beautifully just the way you ordered it! Whether with just company name, logo, message or slogan. We know you want your brand to stand out from all the others, you can when you get your trade show booth ready with The Executive Advertising. We’re the executive company that makes brand and appearance matter first! We have some of the best advertising products there is and the best price and quality for your brand! Shop our different digital trade show tablecloths and we guarantee you’ll find what you need for your trade show booth all right here in our online catalog. 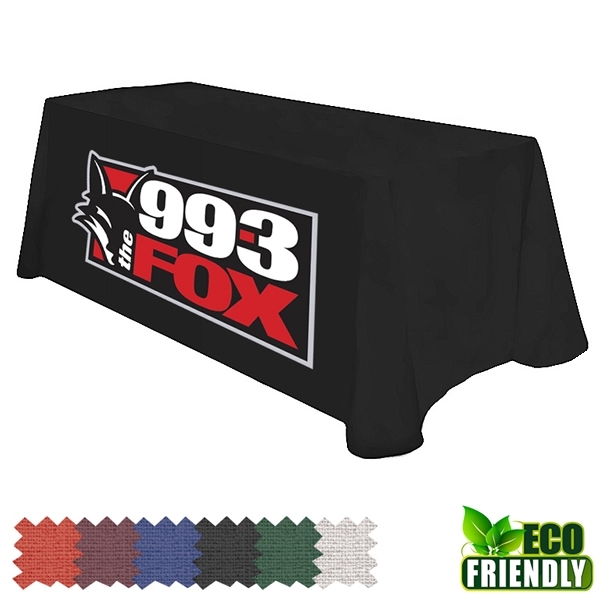 Most of our digitally imprinted tablecloths come in over 70+ colors for your business logo and matching needs. Sometimes today’s market can seem a little harder to please the consumer, but with our amazing promotional trade show tablecloths, they’ll be beautifully designed and so friendly to the consumers eye that they’ll automatically want to see what you have to offer at your trade show booth! The point of your trade show is to launch, show off and sell your new advertising product, so present it with style and appearance that no one will forget! Think about your table first and order your custom advertising tablecloths and then consider all other trade show advertising products you may need to add for your logo and booth. If you’re stuck on which tablecloth might be the best for your advertising campaign, our sales team is ready to serve you with your customizing ideas. Our fantastic logo tablecloths are also great for any company events, weddings, schools and more. No more renting out these promos that you need over and over again, make that one time purchase for your company logo and save so much in the long run and make more on your new product arrival at your trade show booth on your new personalized tablecloth. Previous postCollege Colors Day Is August 29th! Gym Advertising Ideas In The New Year!